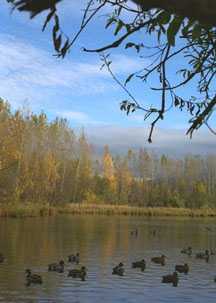 Fall is usually a short season in southcentral Alaska, often ending in early October. The average date of the first snowfall is October 12. But occasionally autumn lingers through late October. 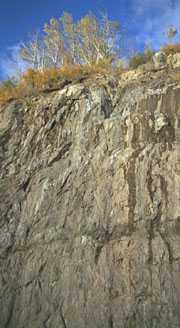 In 1998, the first significant snowfall in Anchorage was on November 10. 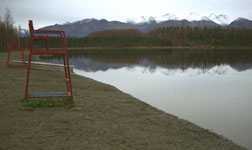 In late October 1995, it was far too cold to go swimming at Goose Lake, near the University of Alaska Anchorage campus. 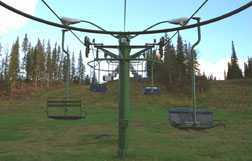 Season ski tickets were on sale at Hilltop, a ski slope in south Anchorage, but there was no prospect of using them. 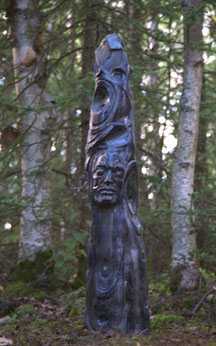 A carving in the woods near UAA's arts building seemed as enigmatic as the weather. 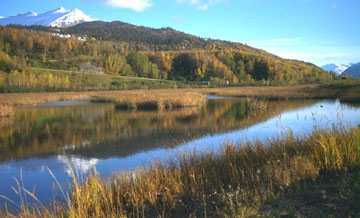 Fall colors, as displayed on mountain slopes near Lake Eklutna, on a cliff face south of Anchorage, and around a pond in Anchorage are far more subtle than those of New England and the American midwest. Looking east along the Turnagain Arm of Cook Inlet, south of Anchorage.